Venerable Diamond Master (Tibetan: Dorje Lopon, Sanskrit: Vajra Guru) Lama Ngawang has already take the spiritual path in his childhood. He got full ordination in the presence of His Holiness the Karmapa and his spiritual sons. Lama Ngawang gave up his secular activities in the wheel of life and fulfilled his religious service. He studied, listened and searched for the pure teachings and practiced them alone in far away places. He participated in a whole three-year-long retreat in Sonada, Darjiling after which he won the honorific title, Diamond Master. Later on he was sent to the West as my resident in Sweden for the benefit of all sentient beings to spread the holy teachings. Let every disciple and generous person know: the goal can be achieved following a lama if one cultivates proper motive, unshakeable faith and trust, if one studies and practices contemplations. Finally, it is essential for you to keep these in mind because in that case you will have the possibility to achieve buddhahood, the state of purity and unity for you and others benefit. I was born in Jangpachen, in Central Tibet at the end of the 1920s, in the year of the earth-snake. Jangpachen is divided into two parts. My county is the Gomangtod area, its main monastery is the Drepung. The county is varied with lovely nature, many kinds of trees and mountains covered with snow. Under these there are rocky hills, below fields with bushes, narrow rivers, graying grounds where wild animals and many types of birds can be found. There are also pine trees with long, soft pine needles from which incense sticks are made. A beautiful land with streams, tiny lakes and dunes with rugged grasses can be seen from here. My parents were nomads living in a tent. I had two brothers, a sister and many relatives. The boys sold the salt of the lakes. My mother, sister-in-law and my sister looked after the animals: goats, lambs, yaks, dris (female yak or cow). Our day started with taking refuge and reading our prayers. The whole family got up before dawn and we were reciting while churning butter. When the sun came up, women went to milk the dris and they boiled the milk. Only after these did we have breakfast. Later the two or tree-hundred goats and lambs were driven down the hills where they were grazing during the summer. The women tethered them to stakes in long lines for milking. From the boiled milk they made yoghurt, butter, cheese which were sold in the villages in summer. In winter we sold fresh and dried meat. In the afternoons and evenings we had a rest after looking after the animals. The family gathered in the tent and we had campa (fried barley-flour) with salty tea with butter and milk. We carded wool, weaved, yarned and practiced sendon – is a Tibetan word means prayer for the benefit of others. The adults were telling stories and talking while they were spinning yak-hair ropes for the tent. The children were playing and listening to tales before going to bed. The older were awake until eleven o’clock in the evening, sitting around the fire, reciting Tara-texts (Tara is the female aspect of Buddha’s compassion). We recited the Mani mantra (OM MANI PEME HUNG) all day, while we were working. Though my parents were Buddhists, I have never heard of Buddhism as a unique doctrine. Simply it was natural for them. I was brought up according the teachings because everyone around me was practicing dharma. I practiced Tara meditation with them by heart as they did. Near us there were schools, monasteries and nunneries. In the monasteries life was considered simply without worries, the monks and nuns did not let the poisons of mind and worldly things make trouble. There was real peace in these places. People gave presents to the monasteries and invited the monks and nuns to their tents from time to time. The monks had a great impression on me. When I was eight, I was dreaming about becoming a monk. I was sixteen when I took refuge at the first time. I gave a curl from my hair to the three Jewels: Buddha, the Teachings and the Community. An outstanding woman-lama from the Nyingmapa tradition celebrated the ritual. She lived in Kagri Tokar, not far from Lhasa on the other side of the mountain pass in a cave on a hill beyond Cangpo (Brahmaputra) river. Her name was Djecunma Ani Rigdzin Chonyi Zangmo, she was a yogini and dakini (wisdom being). Djecunma is a title for female lamas, it means Highly Respected Mother. She was also called Dzogchen Rinpoche. Rinpoche means Precious Teacher. I first met djecunma yogini when I was eight and I wanted to stay with her. Later she gave me my first ordination. She was one of the most well-known masters in Tibet. She lived up to one-hundred and thirteen. There were many monasteries in the neighbourhood, so I went to school one of them. The clerks, the traders and those who had some special rank in the monastery had to learn how to read and write. For the monks it was more important to know the spiritual texts by heart. If there were three girls and three boys in a family, those who were strong enough to make the hard manual work around the house could stay at home and those who could not or just did not want to work hard were sent to a monastery or to the army so that they learn discipline. I was sent to a monastery, my parents did not mind my becoming a monk. Practicing the holy teachings makes a good man. I chose this way. Monastery life is full of work learning, spiritual practicing. When ‘I was fourteen I went on a pilgrimage to Gang Rinpoche, the Kailash, the most sacred mountain of Tibet. The pilgrimage took for three years. When I was seventeen, I went to the monastery of His Holiness the Karmapa in Curpu and there I got ordination once more. This time the ordination was given by Djamgon Kongtrul Rinpoche II. In Curpu I learned different types of meditations: the basic exercises (Tibetan: Ngondro), the meditation on Mityo Dorje (Karmapa VIII) and the exercise of Cut (Tibetan: Chod, the cut of the attachment to the ego) etc. At the age of twenty-two I became a fully ordained monk (Tibetan: gelong). I also learned at the Drepung which is a university besides being a monastery. Later I went to many pilgrimages and I also visited the holy Kailash Mountain many times. After four years I returned to Curpu. I became the head of the Kojul Gompa monastery in South-Tibet on behalf of HH Karmapa. At the same time I went for pilgrimages to India and to the Gang Rinpoche, two times each. Before Tibet was occupied by the Chinese, I went to India and Nepal on foot and I saw many sacred places. These journeys were full of danger and trial. I was thirty-two when I came back to HH Karmapa who allowed me to attend two longer retreats. I mainly practiced the Cut. Now I tell you about the work in the monastery. The day starts early before dawn. The disciples go to their master. They do the washing, cleaning, they learn and study spiritual texts and recite them together. There is a lot of work to do. They have to acquire food and drag it up to the monastery on the steep mountain-side. These were practical tasks mainly. My favourite subject was Dharma. Everyone gives food and other things needed with pleasure to those who really practice dharma. Contemplation was my favourite practice. If one becomes a monk or a nun and spends three years in a monastery, one gets a kind of special responsibility which is getting more serious as the time goes by. I went to retreats many times and I met a lot of holy people which was all the more instructive. I found their lifestyle to be the best solution. My deepest wish and inner hope was to reach the maturity they gathered. If I have never travelled, I would not learn anything. Milarepa said: ‘I have never learned from books written with ink, my masters are the phenomenon of the world.’ I saw the Sakya monastery, Tashi Lunpo and may more sacred places. I also saw a lot of suffering during my journeys. It is good that I could see these. My first master was the female lama Ani Rigdzin Choty Zangmo has already been mentioned from the Nyingmapa tradition. My main guru is HH Karmapa, my meditation master was Lama Drubpon Tendzin (Theja Drubpon). They lived in Tibet and in India. In India I met Venerable Kalu Rinpoche. From the age of twenty-two I was a servant of a lama in Curpu for seven years. It was a hard life. During the years it happened that I did not have time to take off my clothes. In the evenings exhausted from the hard work I threw myself onto the bed and fell asleep immediately. After I crossed to the South part of the Kartsama Lhamo Mountain, I arrived in Nepal. On the boarder I met Tibetan traders who had approximately six-hundred sheeps all loaded. Until the group arrives to Nepal they never remove the loads from the animals. When the sheep carry salt, their load is twenty-five kilos each, which they carry until they reach Nepal. It takes for one month and one week. When people use animals, they never think of the suffering of the animals. In Nepal people exchange a part of the sheeps for guns or they slaughter them as offerings. They are not interested in what are the animals going through. The jaks and the horses also suffer. The sheeps have to transport salt twice a year. People get salt from nature, nobody owns it. They pick salt at the lakes. Four times a year do man and animal have to suffer during the way. Sometimes a few sheep die under the load they carry for so long. The bags heavy with salt are hanging on the sheep, knitted under their tails. The salt becomes wet and rubs their skin till sore. Flies lay their eggs into the wound. One can hear how they buzz in the flesh. The side of the animals looks black from the flies. Many sheep die because of this. The Tibetan and Nepali traders meet at the boarder and they exchange salt and wool to rice. At the other side of Njecang if you follow the route down the hill, you can reach Nepal. Njetchung is the place where Milarepa met the hunter who was hunting for deer. This story is among Milarepa’s hundred-thousand songs. At that time people often told me: ‘You are brave, clever and skilful.’ I thought the same since I was asked to leave my parents and serve others, and I did it. It is not good to be praised because it makes people think too much of himself. Rebuke is the best way of teaching. I worked for look after the young monks and for the monastery. I offered many statues and other things. I gave everything for the sake of the precious cause, nothing was wasted. We usually do not think of the suffering and hard work of the animals. ‘I gathered my properties by my skillfulness’ people think. My friends and relatives said: ’You are brave like a tiger and strong like a bear’. I left my family to show them my courage and strength. It happened once, that I had to carry one-thousand silver coins on my back. I was afraid of robbers and thieves. I wore a fur jacket made from sheep and I sweat heavily. At night it was so cold that my clothes froze and hurt my back and made big wounds. There was one month of dragging and marching to go. In the beginning I was able to cover five or six kilometres, later thirteen kilometres a day. My woolen clothes did not do good my wounds on my back. Then I understood through my sufferings how much do animals suffer from their wounds. I understood there is only one thing which makes sense, and that is dharma. I escaped in 1958 when the Chinese entered in Tibet. Lama Drubpon Tendzin told me that I can stay in Tibet if I wish and I can practice the dharma. But I wanted to follow HH Karmapa and Venerable Drubpon Tendzin who was the master of Karmapa. I wandered with them through Bhutan carrying fourteen kilos of campa, some butter, tea and my parcels. On the way from Tibet to India I did not have money. During our journey from Curpu to Bhutan we were avoiding the Chinese. At nights when there was no moonlight we ate campa and drank tea. We went all night, pitching and tossing and felling over in the dark for 16 nights and days, being in constant terror of the Chinese. When we arrived in Bhutan, we had a seven-day rest in the royal palace, and we got food from the government. I was 32 at that time. I stayed in Bhutan for two months then I went to Sikkim, Baksakali. There I got in a temporary refugee camp for Tibetans. I stayed only for one night after that I took a train to Siliguri and from there a bus to Gangtok. It is near to Karmapa’s monastery in Rumtec. I lived for six years in Sikkim and here among others I completed 108 Nyungne meditations. I practiced a lot in retreats and I went to pilgrimages to sacred places. In Lo I saw a magical place where fire and hot water gushes out from the earth. This fire and water were not created by man. This is a secret and all the more sacred place which holds the blessing of Padmasambhava (Guru Rinpoche) who took the teachings of Buddha to Tibet. I went to Co Pema lake. Around the lake many hermitages can be found. This is the lake where Guru Rinpoche reborn in a lotus after having been burnt on fire. At that time I got full empowerment for Rinchen Terdzo, which consists a lot of therma texts. These are unique texts hidden by Padmasambhava to be the benefit of the forthcomings. I got the empowerment from Dilgo Khjentse Rinpoche who was the head of the Nyingma tradition. I also got many empowerments from Karmapa for example the Dam Ngakdzo and the Kagyu Ngakdzo. After a while from Sikkim I travelled to Sonada to the monastery of Venerable Kalu Rinpoche, which lays next to Darjiling. In Sonada I took part in the traditional three-year-long retreat, this takes for three years, three months and three days. I stayed in Sonada for six more years where I was the leader of the common meditations (dorje lopon) and responsible for the altar of the monastery (chojok), I made a lot of tormas and mandalas. When I traveled to India the third time, I got Kalachakra empowerment from HH the Dalai Lama in Bodh Gaja. I went to pilgrimages to Co Pema lake. During my two years in Gaja I made a four-month-long retreat. After these I returned to Sonada to prepare for my journey to Europe. It took a year to get ready my papers. During this time I made 36 Nyungne meditations. Finally I got to the centre of Kalu Rinpoche in Plaige, France. Originally I did not think of going to Europe but HH Karmapa said that after the three-year-long retreat it is going to be useful to travel there whether I speak the language or not. This was their wish. Going through suffering and pain I gathered plenty of experience. Sometime I was together with saint lamas, sometimes with beggars. While I was wondering and traveling, I gathered a rich knowledge from the variety of the environment. 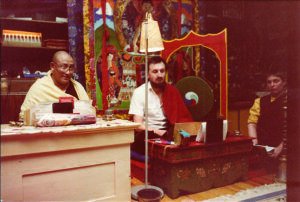 After spending some time in France, in 1976 Kalu Rinpoche sent me to the dharma centre of Stockholm, named Karma Sedrup Dargye Ling. I think everything went smoothly when I came to West. According to my first impression, in Sweden people are less open what I was get used to in Tibet. Because my lack of the spoken Swedish there were communication problems, but thanks for my interpreter, Sonem Tendzin Djamjangling I found my place, I have been teaching and I can be for the benefit of many. In my country, Tibet the religious spirit is very strong. We were brought up according to the spirituality of the Buddhist teachings, dharma to show loving kindness towards sentient beings. This spiritual knowledge was handed-down from generation to generation. Today this tradition is intimidated by the new materialism. This is why it is extremely important for me to pass through my knowledge about dharma. I want to do this without political back thoughts just like the balmy flowers in the garden. My duty here in the West is to teach as Buddha did it once. I want to show a way which leads to the liberation from suffering in the next life, too. The young in Sweden often live among very good material conditions. Many of them get everything. But they neither know what a harmful act is, nor what death is. They do not know how to be for the benefit of themselves and for the society. Western people often attached to too many objects, properties, possessions. They can hardly open their mind. To be in harmony with ourselves, the purification of soul is needed. We have to train our ability for understanding, we have to contemplate on the ephemeral nature of the things and we also have to prepare ourselves for the next life. I would like the young to get to know the dharma through practicing Buddha’s teachings. I want to show with the help of various methods how it is possible to transform the ‘negative’ characters into beneficent power for the benefit of ours and the outside world. Man was born with great possibilities! I did not come to West in this long way to convert people to Buddhism. I came to help them. Everyone has to choose his own way. Dorje Lopon Lama Ngawang has been the dharma teacher and venerable leader of the Karma Tenpe Gyalcen Tibetan Buddhist community and the Karma Shedrup Dagye Ling Buddhist centre, Sweden. Lama Ngawang brought important papers and devotional objects like the Kangyur and Tengyur, a huge collection of the Buddhist canon, setting up a valuable Buddhist library for the forthcoming generations. 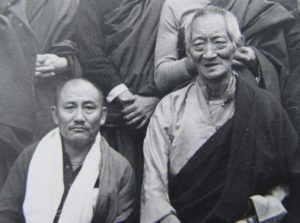 Venerable Lama Ngawang was the founder of the Karma Detsen Ozel Ling Centre of Studies and Retreats which was consecrated by Kalu Rinpoche in 1980. Here Lama Ngawang headed three times the traditional three-year-long retreat which is for the higher education of lamas in Tibetan Buddhism. He also headed several shorter retreats and courses. He gave help to rebuild a crumbling shed into a nice temple with kitchen and guestrooms. Lama Ngawang accomplished everything with great knowledge and took part in the reconstructions, too. For the temple of Stockholm and Fellinsbro he purchased and made a lot of beautiful things. The Centre became a little dharma village with small houses a round the marvellous white stupa built on the initiative and spiritual leadership of Lama Ngawang by the members of the community, the participants of the three-year-long retreats and many others. The stupa is the symbol of the most important basic principle: the respect of life and non-maleficing. It is also the memorial of understanding, freedom, equality and peace among nations and people. In the stupa precious relics, sacred texts and symbols are placed, this is why the stupa is a powerplant of beneficial spiritual power. The stupa in Sweden was consecrated by HH the Dalai Lama in 1988. Lama Ngawang also established the ‘info coffee’ which works for the visitors and also gives place to the courses. A number of Hungarian Buddhists took part in the constructions of the Fellinsbro Retreat Centre and they asked Lama Ngawang to found a meditation centre in Hungary. In 1989 the Karma Ratna Dargye Ling Retreat Centre was established in Tar, Nograd County, Hungary where with the leadership of Lama Ngawang a twelve metres high stupa was built. The stupa was consecrated by HH the Dalai Lama in 1992. 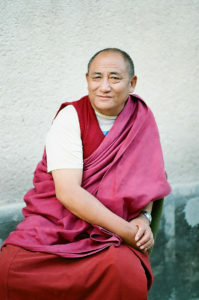 In Csillaghegy, Budapest Lama Ngawang established a new centre in 2001 named Karma Dorje Ling. He spends approximately three months in the Hungarian centre. He gave teachings all over the country and in the neighbouring countries. Lama Ngawang is an outstanding personality of the development of the Tibetan Diamond Path Buddhism in Sweden and in Hungary. Rinpoche took the initiative in HH the Dalai Lama’s travel to Sweden in the beginning of the 1980s. Our communities took part in the organisation of significant visits, for example when the stupa of Fellinsbro and Tar was consecrate or at the visits of HH Karmapa, Sakja Trizin Rinpoche and many high lamas. The life and activity of Lama Ngawang is characterized by deep understanding and active compassion. In particular, he always shows great honour towards other Buddhist lineage and the religions of the world. He took part in meetings between different Buddhist lineages and other religions. It is extraordinarily unforgettable how he cares towards animals, including fish and insects. His leftover, every tiny pieces of rice feeds well the inhabitants of several ant-hills and the birds around the centre. Lama Ngawang always emphasizes the importance of giving without expecting. The animals accept donation without asking more, not like people. Lama takes the opportunity to make people realize the painful outcomes of hunting and fishing, because animals have consciousness and feelings as we humans have. To the pupils who visit our centres he speaks about the basic rules of Buddhism: to save the life of every being but he also speaks about the possibilities of studying and development, the clever use of the given possibilities and the harmful effects and dangers of alcohol and drugs. According to Lama Ngawang, the most important rule of our centre is receiving school classes. The young think critically but they are open at the same time. They can have an effect on the formation of their lives while for the elder it is more difficult to change their conditioned costumes. The description of Lama’s life would not be complete if we did not mention his naturalness, informality and spontaneousness. When visiting the centre in Stockholm, HH the XVI. Karmapa told us that Lama Ngawang dedicates his whole life to the practicing of the inner path and he is able to lead his students to the recognition of the true nature of their mind, so to say to the experiencing of the enlightened state. We can see that Lama is not interested in the worldly activities or talks. Lama is a living example for us not to do what others expect, but always act from an experienced understanding. His lifestyle shows the realization of the knowledge in practice how to act properly in the different situations of our lives. With this short summary in which Dorje Lopon Lama Ngawang spoke about his life, many difficult trials and his hard work for dharma we would like to express our deepest acknowledgment for the deeply appreciated Lama who is the supporter and helper for many of us. His warmhearted, motivating, caring presence is not less important. We honestly hope that he is going to live with us for long in good health and happiness.